JERUSALEM - Israel's foreign minister charged Monday that Palestinian President Mahmoud Abbas is an "obstacle" to peace and that he hopes Abbas will soon resign. The comments by Avigdor Lieberman drew an angry response from Palestinians, who accused him of calling for an assassination and appealed to the United States and the European Union to intervene. In a briefing with reporters, Lieberman lashed out at the Palestinian leader, saying Abbas has been leading a campaign to delegitimize Israel internationally and that he has become an "obstacle that needs to be removed." Abbas is leading a drive for U.N. recognition of a Palestinian state. On Monday his envoy urged the world body not to delay acting on the Palestinian request. Israel and the United States fiercely oppose the bid, saying independence can be reached only through negotiations. Peace talks have been largely frozen for more than two years. They broke down the last time over the issue of construction in Israeli settlements. In the past, Abbas has repeatedly threatened to resign if there is no progress in peace efforts. Lieberman called on him to carry out his threat. "He has been threatening to return the keys and resign? That would not be a threat but a blessing, and I wish he would finally do it," Lieberman said. "Whoever comes after him will be better ... there is no lack of Palestinians who studied in the West  educated people with Western values with whom we can talk." Lieberman said that despite Abbas' moderate image, he was naming public squares after terrorists, handing out money to killers who were released in last week's prisoner swap and calling for a future Palestinian state that was free of Jews. Lieberman added that Abbas was concerned only about his personal survival after the overthrow of his "friends" in Tunisia, Egypt and Libya. "That is very understandable, but it doesn't help in reaching an agreement," he said. Yasser Abed Rabbo, a top aide to Abbas, fired back, calling Lieberman the "most extreme, racist person in Israel." "Lieberman is an enemy of peace and he should be condemned by every rational voice in Israel," he said. "If this position represents or reflects the policy of this government, that means that they intend to wage a political war. The Israeli government should apologize for what the foreign minister said." Palestinian negotiator Saeb Erekat added that Lieberman's comments amounted to incitement and could be interpreted as a call to assassinate Abbas. He said he relayed that message to Americans and Europeans as well. It wasn't clear whether Lieberman was expressing his own opinion or government policy. He's spoken out of step with Prime Minister Benjamin Netanyahu before, most notably when he told the United Nations that there was no point in negotiating with Palestinians  just as peace talks were being relaunched in September 2010. A Netanyahu spokesman refused to comment Monday. 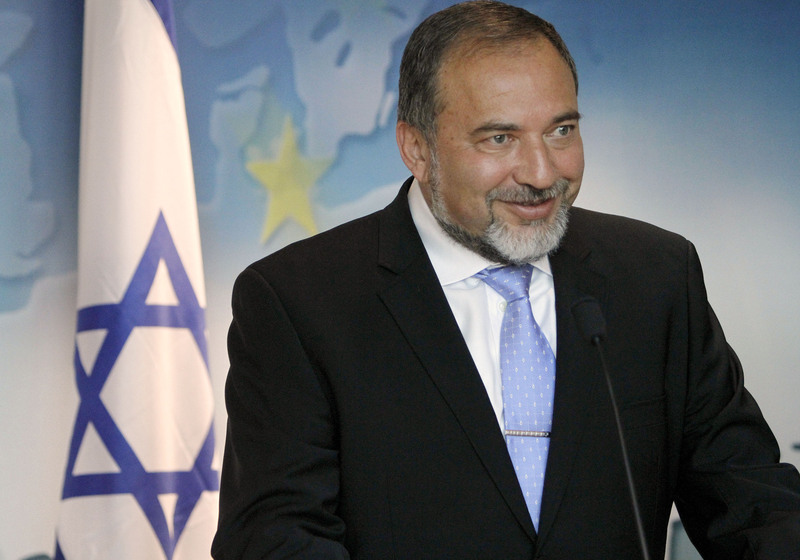 Lieberman is known for his fiery nature and outspoken criticism of Palestinians. He's also a contentious figure because of his support for redrawing Israel's borders to push areas with heavy concentrations of Israeli Arabs out of Israel and into Palestinian jurisdiction. He also launched a failed effort in parliament to force Israeli Arabs to take a loyalty oath or lose their citizenship. Lieberman said he was "100 percent" sure that the establishment of a Palestinian state in the current climate would lead to rocket attacks against major Israeli population centers. Gaza militants have fired thousands of rockets at Israel since Israel's pullout in 2005. He also vowed that there would be no settlement construction slowdown. He noted that the settlements made up less than two percent of the West Bank and therefore "have never been an obstacle to peace."